In August of 2018, our organization shifted our name from New Schools for Chicago to Kids First Chicago. The publications and reports listed below include those published prior to our organizational name change. To learn more about our history, please visit History. In August 2018, New Schools for Chicago became Kids First Chicago to better reflect our commitment to better reflect our broadened “all schools” focus and new strategic direction that we introduced with our re-launch in 2015. We initially developed Kids First Chicago (K1C) as a campaign of New Schools for Chicago to empower parents and communities with more quality information about our public school and to elevate their voices to drive “kids-first” policy change. This approach has become a defining characteristic of our organization, providing the impetus for our name change. Read more about our work and accomplishments from 2016-2018 in our Impact Report. The Annual Regional Analysis (ARA) is a report produced by Chicago Public Schools (CPS) every year. It is a consistent set of information on enrollment, student demographics, school quality, school choice, and program offerings organized by region. It shows improvements over time as well as illuminating areas for district intervention and collective action. The report presents data, but does not make recommendations or action steps, rather serving as an input to community engagement and joint solution development. This handy user guide gives you “food for thought” as you navigate the ARA, and provides questions for consideration and/or discussion. Kids First Chicago is committed to putting parent feedback at the heart of all that we do. 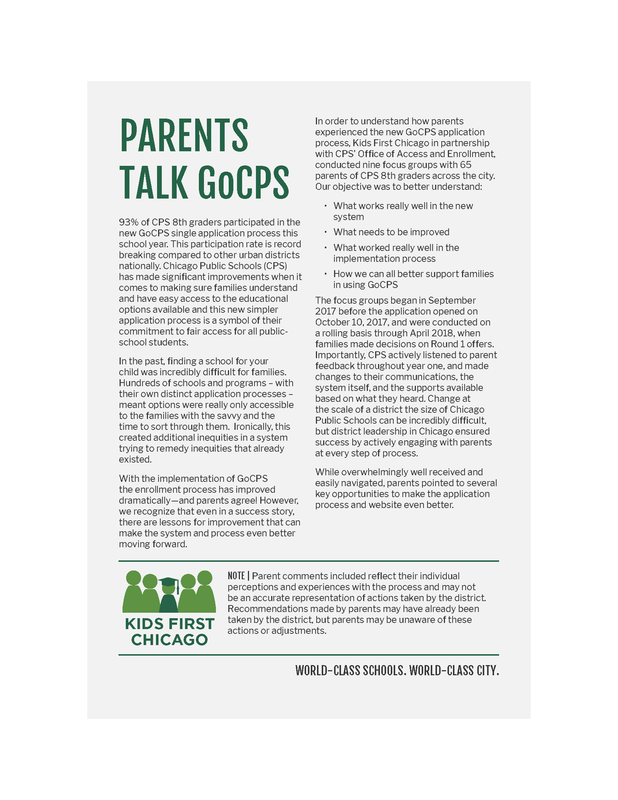 In order to understand how parents experienced the new GoCPS application process, Kids First Chicago, in partnership with CPS’ Office of Access and Enrollment, conducted nine focus groups with 65 parents of CPS 8th graders across the city. Read the report to find out more. A series of education-related stories told by real Chicagoans. Chicago's schools have the capacity to dramatically impact students and families. We wanted to create a platform to share authentic stories of real Chicago students, families, and educators to illustrate one key point: that great public schools really do matter. We invite you to watch the stories below. WHO IS SITTING IN THOSE SEATS? 2017 PARENT FOCUS GROUP. Parents gather in a school library to share their experiences with the Chicago school enrollment process. In January 2017, we organized 10 parent focus groups with Chicago Public Schools (CPS) and the Institute for Innovation in Public School Choice (IIPSC). Neil Dorosin, co-founder and Executive Director of IIPSC, facilitated the focus group sessions with more than 100 parents. IIPSC released a full report, Parents Discuss their Challenges with Public School Choice in Chicago, on April 24, 2017. The report highlights the barriers to success of the current application process for CPS and issues a set of recommendations to improve the process for families. Overall, IIPSC found that CPS parents feel dissatisfied with and confused by the current system. The report calls for CPS to make it easier for families to get the information they need and supports a single application for students to apply to high school, regardless of school type. The Chicago Board of Education voted unanimously to support a single application at its April 2017 meeting. IIPSC’s report—and our work to engage parents actively in the decision-making process—provided the additional momentum to bring Universal Enrollment over the finish line in CPS. In 2015, Kids First Chicago (as New Schools for Chicago) engaged in an organizational restructure. We recognized that the market had shifted and our strategies needed to shift as well. While our overarching goals have remained constant—to ensure that the marketplace operates effectively and efficiently for families—our current strategies are designed to ensure that families continue to have the options they want, that schools are high quality, and that policies reflect a “kids-first” mindset. This ecosystem-focused work serves as the second wave of improving outcomes and dramatically reducing the number of students who end up trapped in low-quality school seats. A healthy, efficient ecosystem will allow great schools to thrive—providing 50,000 additional high-quality seats to kids in Chicago by 2020. We invite you to explore key milestones and progress.